One of the original country lanes of the district, Hurst Lane wends its way up the hill from Palmerston Street at the library to Kerridge. Approach off Palmerston Street, Grimshaw Lane. Leads to Woodbridge Close, Greenbank Drive, Highfield Road, Poplar Grove, Ward Avenue, Gleave Avenue. Nearest pubs – Dog & Partridge, Bull’s Head at Kerridge. Council Ward – From Palmerston Street to the canal bridge, Central; from the canal bridge to Grimshaw Lane, east side, Central, west side, East. The middle part of the street is without pavements. 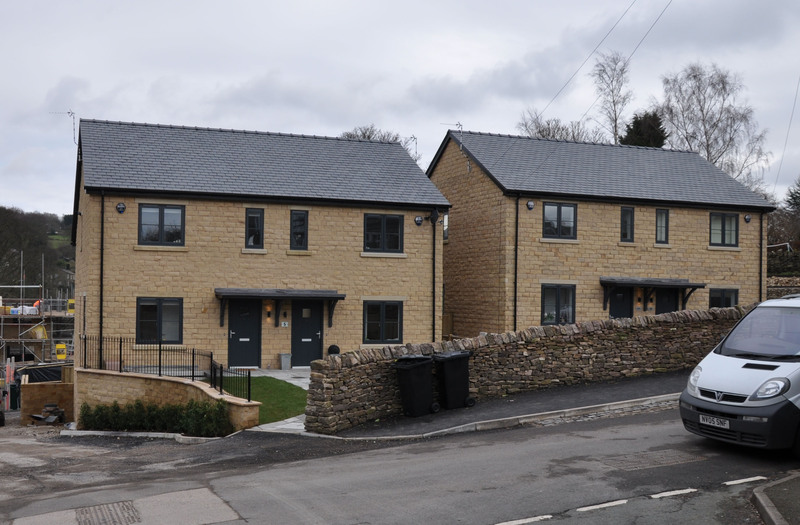 Many of the properties along this stretch have been upgraded and had improvements made to their front gardens. 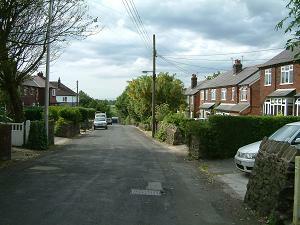 The bottom part of the street is known by the older members of the community as School Brow. This comes from the fact that the large Sunday School used to stand where the Library and Civic Hall are today. See Brows. The top of School Brow was probably re-located when the Macclesfield Canal was constructed in the late 1820s – certainly the section adjacent to the canal bridge. 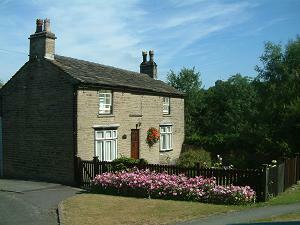 Aqueduct Cottage (left) was once the Navigation Inn. There are stables beneath to overnight the canal horses. The canal wharf was for much of the 20thC Needham’s timber yard. The Needham family operated here for more than 80 years. This site was owned by Canal & River Trust, who manage the canal network, and they sold it for re-development with six houses which were being built in 2016/17. These are now complete (2018), and named “Woodbridge Close” (below). Towards the top of the lane there are three notable old properties, Hollin Old Hall, Bleak House and Hurst House. In the 19thC this lane was known as Kerridge Road. I don’t know when the name change occured. The canal bridge is still properly referred to as Kerridge Road bridge. It could have been because there was confusion with Kerridge Road which goes from the end of Windmill Lane down through Swanscoe to the Hurdsfield/Rainow road! The name Hurst comes from Hyrst which in olden times meant a wooded hill. One can imagine this as part of the Macclesfield Forest which, in the Middle Ages, included the Bollington area. Macclesfield Canal bridge no.27 under Hurst Lane ; II, built c.1830 by William Crosley, engineer. Properly known as Kerridge Road bridge (see text above).